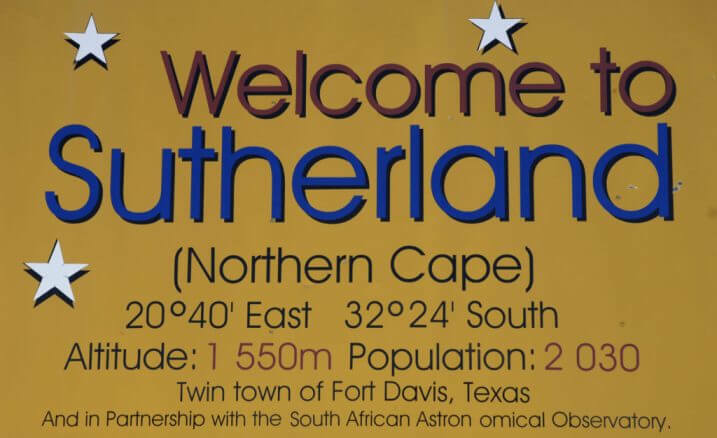 Sutherland is a town in the Northern Cape province. It lies in the western Roggeveld Mountains in the Karoo. Established in 1858 and named after a prominent Worcester cleric, Reverend Henry Sutherland, the town on the Roggeveld Plateau 1 450m above sea level is known for its brilliant night skies and cold, biting winters, known to be the coldest place in SA. The town attained municipal status in 1884. The town also has the lowest recorded temperature drops in South Africa, with tourists flocking to Sutherland in order to experience extreme, cold nights under the stars. The town has grocery stores, a commercial bank and an ATM, one petrol station and several guest houses and restaurants. The ‘sterboom’ (star tree), which blossoms in September is found on farms in the region. Birthplace of Afrikaans author and poet NP Van Wyk Louw, the town is said to produce the finest mutton in the country and is home to the world-renowned South African Astronomical Observatory. The region is also home to the endangered Riverine Rabbit. Sutherland falls under the Karoo Hoogland Local Municipality which is a Category B municipality situated in the Namakwa District of the Northern Cape Province. It is the second-largest of the six municipalities in the district, making up a quarter of its geographical area. Although the municipality’s towns are separated by more than 100 km’s by road, they share many administrative tasks. Hoogland is an Afrikaans word meaning ‘highland’ and Karoo is a Khoi word meaning ‘hard’ or ‘dry’. The name reflects the area, which has dry, arid and desert-like conditions. Cities/Towns close to Sutherland are Frasersburg and Williston. Stargazing in Sutherland, tasting Karoo Lamb chops in the Hantam area and picturesque scenic drives in the Kamiesberg are also popular among our existing tourist market. 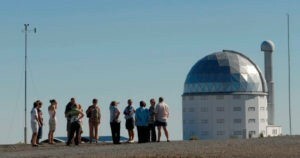 Since the early 1970s, the major telescopes of the SAAO have operated on a hilltop 1 800 metres above sea level, near the Karoo village of Sutherland, about 370 km inland. The site was chosen for its good weather, semi-desert setting, absence of light and other pollution. Tour guides will meet you at the Visitor Centre at your scheduled time. If you arrive early please wait at the Visitor Centre for your guide. This is a secure site and all other buildings are off limits to the public. 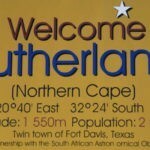 A visit to Sutherland is something everyone should undertake at least once. Fraserburg is situated 105 km north-east of Sutherland.